Chances are good that if you are in the market for .380 ACP ammunition, it is for use in a deep-concealment pistol. And if you are carrying a deep concealment pistol in .380 ACP, it is probably for a reason: whether it is your daily commute, sketchy establishments that you may have to be in, or just due diligence in self-preservation. 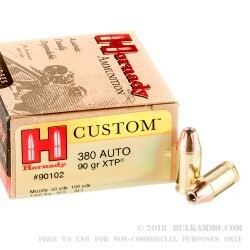 Whichever it may be, the .380 ACP is a formidable weapon when paired with the correct ammunition and Hornady's line-up of XTP rounds is one that's been trusted for years. As most shooters are aware, longer barrels equate to higher velocities which also equates to high muzzle energy. 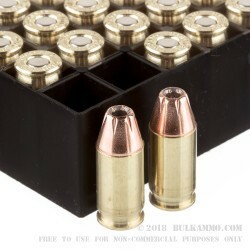 A standard 9mm fired from a 16” carbine barrel exhibits considerably higher velocity and energy than an identical bullet fired from a standard 4” duty pistol. This has been the problem which plagued deep-concealment handguns for decades: how do you increase stopping power when barrel lengths are sometimes less than 2”? This becomes an even more significant issue when recoil is taken into consideration. 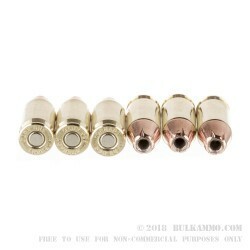 You can compensate for shorter barrel lengths by increasing power, a tact which was taken by converting the small-frame, 5-shot revolvers into .357 Magnums. Yes, they were much more powerful than the .38 Special variants, but also utterly unshootable from the massive increase in felt recoil. The solution to this problem has come in the form of advanced projectile technology rather than stuffing big-bore power into small-frame firearms. Modern bullets like Hornady’s XTP® leverage the advancements made in projectile development and optimize them for a low-power platform like the .380 ACP. Now, you can harness excellent stopping power without having to compromise size and concealability.